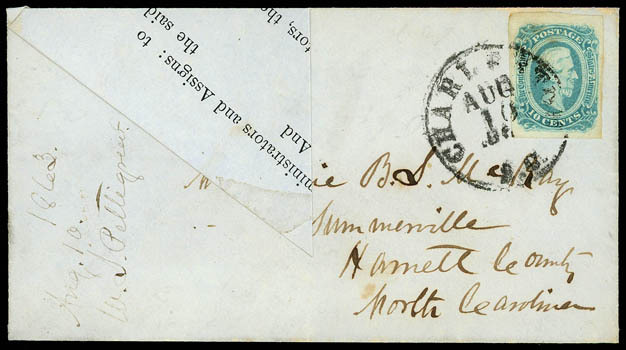 Confederacy, 1862, 5¢ blue, Stone 2, two four margins singles, each neatly cancelled by two manuscript strokes, matching "Zeno S.C., York District, April 14th" postmark on blue adversity cover made from lined printed form to Raleigh Miss. ; folded for display, Very Fine and scarce use from a "Z" town. 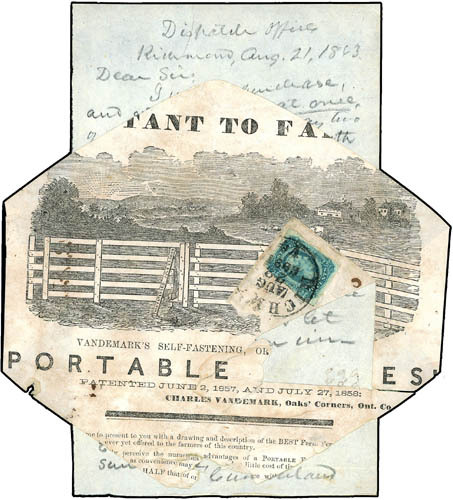 Confederacy, 1863, 10¢ blue, tied by "Richmond Va., Aug 22, 1863" cds on adversity cover made from illustrated Charles Vandemark Portable Fences advertising circular to Sunny Side, Cumberland County, Va., original letter datelined "Dispatch Office, Richmond Aug. 21, 1863" asking for the purchase of a farm; some faults including cut for display, Very Fine. A REMARKABLE ADVERSITY COVER USE MADE FROM AN ILLUSTRATED FARM SCENE ADVERTISING CIRCULAR FOR PORTABLE FENCES. This is a striking piece demonstrating the chronic paper shortage in the South. 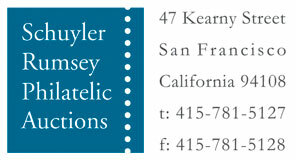 Poor quality paper has provided a short pencil letter and an advertising sheet for fencing used as an envelope. 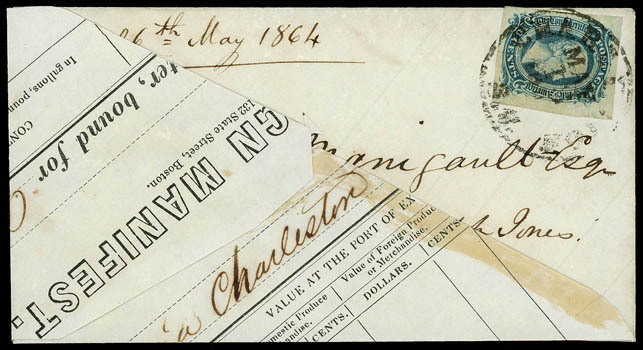 Confederacy, 1863, 10¢ blue, four large margins, tied by "Charleston, S.C., Jun 15, 1864" double-circle postmark on small adversity cover made from red, white & blue printed Bank Check, addressed to Walterboro S.C.; part of cover opened out to show adversity usage and reinforced split along fold, Very Fine and attractive. Confederacy, 1863, 10¢ blue, large margins to ample, beautiful shade on bright paper, cancelled by red grid, matching "Abingdon Va. Aug 18" cds on adversity cover made from part-printed receipt to Wytheville Va., Aug. 1863 docketing, opened for display, light file folds not affecting stamp, Very Fine and beautiful adversity use. Confederacy, 1863, 10¢ blue, large even margins, tied by "Charleston, S.C., Oct 22" cds on Adversity cover made from a blue Court Disposition Document to Columbia, S.C.; folded out for display, Extremely Fine and choice, a lovely adversity usage, Pictured in Monroe Book on page 40., ex-Cantey. 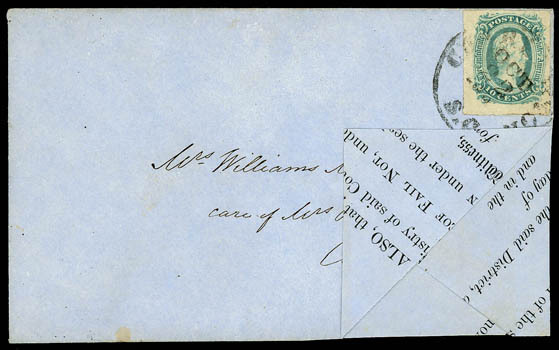 Confederacy, 1863, 10¢ blue, four large even margins, tied by "Rocky Mount, N.C., Mar '7' " cds with pencil date on blue adversity cover made from printed form addressed to Iron P.O., N.C., Very Fine and attractive. 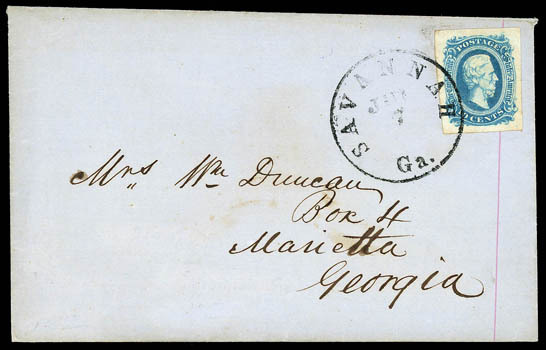 Confederacy, 1863, 10¢ blue, huge margins, beautiful vibrant color on bright paper, tied by "Savannah Ga., Jan 7" cds on blue adversity cover made from lined paper, addressed to Marietta Ga., Extremely Fine. Scott No. 11 Estimate $100 - 150. 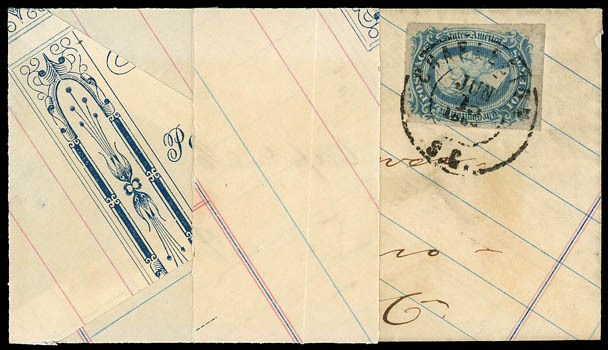 Confederacy, 1863, 10¢ dark blue, large to huge margins, rich color, tied by "Charleston S.C., May 18" cds on blue adversity cover made from printed manifest for goods bound Antwerp via Charleston, addressed to Louis Manigault at Augusta Ga., Extremely Fine. Scott No. 11b Estimate $200 - 300. Confederacy, 1863, 10¢ blue, large margins, beautiful color and sharp impression, tied by neat "Charleston S.C.Aug 10, 186" cds on blue adversity cover made from printed form, addressed to Summerville N.C., docketed "1863, Aug. 10. W.S. Pettigrew" at left, Extremely Fine and choice. Scott No. 12 Estimate $300 - 400.